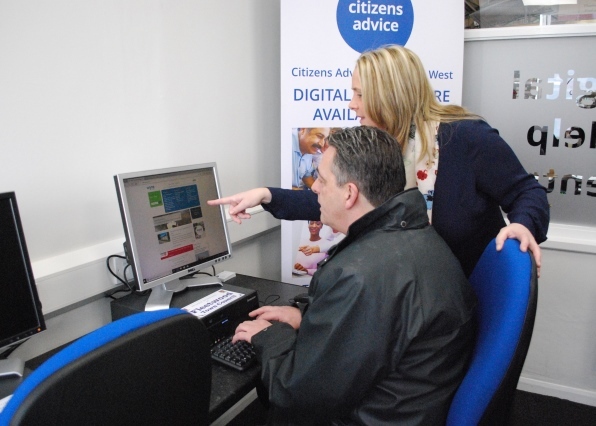 Citizens Advice (Lancashire) were looking to develop a digital help centre in Fleetwood recognising that many people in the area require support to access benefits / services online. They approached Wyre Council and together we came up with the idea of utilising a council asset, Fleetwood Market. The council invested in the capital works and renovated 2 vacant units at the market to create a room to hold a number of computers and meeting rooms, one for Citizen’s Advice and one for the Council – the Digital Help Centre or ‘hub’ was formally launched in February 2018. The hub is able to assist people to get online, access vital benefits and other services and help them to develop new IT skills and even work towards a qualification. The hub is staffed by Citizen’s Advice and a council officer and is also available for when enquires are related to housing benefit or other council services. It has been very beneficial working in partnership with Citizens Advice, they have helped the council to make better use of our asset and bring new people to Fleetwood Market whilst also helping lots of local people to get digitally savvy. The longer term aim is that this work will help people to use the skills they have learnt in their everyday lives. Regenda, our social housing provider, has started to refer their tenants that need digital support to the hub which is great and can be encouraged for other partners. We are exploring whether the hub model could work for other areas of Wyre. Fleetwood Market, is one of the oldest markets in Lancashire when market rights were first granted in 1275 and first exercised by Sir Peter Hesketh-Fleetwood (founder of Fleetwood town) in 1840. The market has remained a constant through many times of change and is vital for the economic regeneration of Fleetwood. The revitalisation of the market is a key project for Wyre Council and a programme of improvements is in place to explore ways to increase footfall and encourage local people to use the market once again. Bringing the Digital Help Centre to the market is seen as a way to bring local people back to the market. It not only helps the people of Fleetwood through the digital skills they will develop but if we can encourage them to then go and shop at the market it helps to sustain a valuable asset which is important for the economy of Fleetwood. This collaborative project has been made possible thanks to a partnership approach including the council investing in the accommodation and Citizens Advice for making the Digital Help Centre happen.